Let’s start with a premise. The object of feeding Oscars in captivity is to duplicate or simulate the fish’s diet in the wild. To provide them with nutrition that nature has designed the Oscar’s body chemistry to metabolize. What Does a Wild Oscar Fish Eat? How often do you feed Oscar Fish? The major portion of a wild Oscar’s diet consists of insects and crustaceans such as freshwater shrimp and crawfish. Oscars are not piscivores (carnivorous animals which eat primarily fish.) Fish actually comprise a minor portion of their diet. Oddly enough, the primary fish prey of Oscars in the wild are catfish. Keep that in mind when selecting tankmates. Oscar are not carnivores (animals which eat only meat.) In the wild, a significant component of an Oscar’s diet is fruit that has fallen into the water. As a result, Oscars have a high dietary requirement for Vitamin C.
In addition to fruit, a significant component of a wild Oscar’s diet consists of algae and green plants. Not because they seek out these foods and eat them, but because these are the gut contents of their prey. The primary component of your Oscar fish’s diet should consist of a quality pellet. There are many available and each (quality pellet) will contain enough of the necessary proteins, vitamins, and plant/algae to provide your Oscar with the necessary nutrition. Cheap pellet food will not! Flake foods are not considered as acceptable foods for an Oscar. So, don’t plan on flakes being the primary component of your Oscar’s diet. Flake foods are nutritionally inferior to pellet foods and finding a flake big enough for an Oscar is difficult. When feeding Oscars, a quality pellet should be your primary choice, even for juvenile/baby Oscars (get a small pellet). A pellet that contains high levels of Astaxanthin will help produce those vivid red colors in our Oscars. Krill and shrimp shells (krill preferred) naturally contain high levels of Astaxanthin, so if Astaxanthin is not listed in the ingredient list but krill or shrimp are, it’s covered. You can also use frozen or freeze dried krill as a supplemental food to achieve this benefit. Finally, I prefer a floating pellet to a sinking one. I don’t want anything on the substrate of the aquarium that my fish is going to eat. Why? Because I don’t want to run the risk of my fish ingesting the substrate by mistake. Many Oscars are lost every year from bloat and the “unknown” cause of many of these bloat ailments is the fish ingested gravel, the gravel caused blockage and resulting death. So, by feeding a single, carefully selected pellet food, we can simulate (not duplicate) and even improve upon the diet of a wild Oscar. Is this sufficient? No. The problem with an Oscar’s diet that consist exclusively of dried foods, such as pellets, is that this can contribute to constipation, which can contribute to blockage, which can contribute to bloat, which can cause death. Pellets that contain probiotics can help minimize this risk but the best option is to include supplemental foods with higher levels of moisture. If you are not one to feed live foods, SeaChem manufactures NutriDiet, which is a way to introduce “live type” foods without them actually being alive. You can also use fresh or frozen shrimp (the same stuff you buy for yourself) as well as the myriad of frozen krill and shrimp products that are available in the hobby. A common practice amongst Oscar enthusiasts is to inject these foods with a fish specific vitamin product, such as Boyd’s VitaChem (diabetic type needles/syringes can be bought online or purchased at Walgreens, provided they don’t think you are a drug addict.) In fact, this concept can help you determine what frozen food to feed your Oscar. If it’s too small for you to inject liquid vitamin with a needle, it’s too small for your Oscar. This would include frozen bloodworms. Although frozen bloodworms are acceptable for baby/small juvenile Oscars, I don’t consider them a good choice for adult Oscars. Another supplement to your Oscar’s diet can be different fruits and vegetables, provided your Oscar will eat them (Many Oscar enthusiast have had luck). Oranges, being high in Vitamin C, would be a wonderful addition to the diet of an Oscar. People have also had luck with items such as bananas, cantaloupe, water melon, zucchini, cucumbers, and green peas. Green peas are a natural laxative and we often use them when curing our Oscars of constipation and constipation caused bloat. Fruits and veggies that contain seeds should have the seeds removed prior to feeding, to prevent their possible contribution to blockage. Just remember, these foods will foul the water quickly, so either the fish eats it soon or you remove it from the tank. So, nutritionally we have fulfilled all requirements. Is there anything left? We’ve dealt with every aspect of a healthy Oscar fish’s diet without using any form live foods. Is this sufficient? Nutritionally, absolutely, but I think something is still missing that does not involve nutrition. It involves the fish’s mental state. Use of some form of live foods stimulates your captive Oscar’s mentality and “duplicates” the diet of a wild Oscar. It awakens the hunter. There is no doubt in my mind that my Oscars are healthier, more colorful, and more active when live foods are a regular, if infrequent, component of their diet. The almost exclusive live food I use when feeding Oscars are crickets. Every so often, more in spring and summer than in winter (because I catch them in my house and yard at these times of the year) my Oscar gets live crickets, and he loves them. Crickets allow for the “hunter instinct” to kick in, providing that mental stimulation I am looking for. The second recommendation I would have for live foods are any of the various freshwater shrimp or crawfish. If feeding large crawfish, be ready for gore and lots of cleanup. Earthworms and mealworms are other good options, although I find they do not provide the same level of stimulation as crickets or shrimp. If feeding crickets, grasshoppers, or worms you’ve collected yourself, just be sure they have been caught in an area where pesticides or weed killers have not been used. One thing, I assure you, a wild Oscar swimming in a tributary of the Amazon River has never eaten is a goldfish. Do Oscar’s eat fish? Sure, fish are a component of their diet in the wild. But goldfish are not. Why is this an important distinction? Goldfish are cold water fish. As a result, their flesh is much higher in fats than are fish the Oscar’s digestive system is designed to consume. Increased fat in an Oscar’s diet can contribute to fatty liver disease. In addition, the flesh of goldfish contains high levels of an enzyme called thiaminase. Thiaminase destroys Thiamin (Vitamin B1). So by feeding goldfish to an Oscar, you are contributing to a vitamin deficiency in your fish. If you are feeding exclusively goldfish, you are slowly killing your fish through malnutrition. HITH has many causes, but a very common cause of HITH is a diet heavy in goldfish. It’s very simple, feeding an Oscar goldfish is a bad idea. The one live food I do not recommend feeding Oscars, primarily because of the hazards it presents, are live fish. We’ve already been through the goldfish discussion so we know that is a no-no, but nutritionally speaking, other warm water fish such as guppies, mollies, platys, sword tails, convict fry, and danios are perfectly acceptable and many pet stores sell “feeder” versions of these fish. Most of the feeder fish carry pathogens that Oscar fish are not immune to. You’re at high risk of introducing parasite, bacteria, or virus in your tank. The second danger involved with using feeder fish is sheer ballistic destruction. Oscar’s are already clumsy fish and nature has not prepared Oscars for objects such as glass heaters, filter intakes, sharp edges on castle ornaments, or the knife like sharp edge of an HOBs outflow. When you drop in a feeder, especially an athletic active one (such as Convict fry), all hell is going to break out in your tank, with your Oscar bouncing off one object to another in an attempt to capture its prey, which always somehow winds up hiding behind that glass heater, which gets shattered and all the fish electrocuted, or behind the outflow of an HOB, which the Oscar attempts to ram through, resulting in massive gashes on its forehead or body, or hidden behind the spraybar, whose suction cups no longer hold. End result, the Oscar knocks the spraybar out of the tank and the filter is pumping water onto your floor. You’ve been warned. That counts as the dog biting once. If it bites twice, it’s your fault. If you are thinking of breeding convicts and using the fry to feed your Oscar, think again. We’ve all tried and in each instance, it results in the inevitable over run of convicts. They are simply too athletic, your Oscar cannot catch them, and the best that will happen is your Oscar gives up. Soon you’ll have several convict fry living in your Oscar tank who will start breeding there as well. Another food a wild oscar has never seen is beef, hamburger, any poultry product, or beefheart. All of these foods are extremely foreign to an Oscar’s system. Each is higher in fat content than even goldfish. So using these foods in your diet, again, is contributing (at a minimum) to fatty liver disease. An Oscar should never be feed these foods. Let alone something as vulgar as dog food or cat food. These foods should simply be rejected as an option. Oscars should never be fed mammalian or poultry flesh. Easy rule, if it has hair or feathers, four feet or wings, it should not be considered as a source of food for your Oscar. There are many answers to this question but only one concept to remember. A Hungry Fish is a Healthy Fish. This is important. If you are feeding your Oscar to a point where it is no longer hungry, you are negatively impacting your fish’s health. Think again of the premise that started this article. Wild Oscar’s do not get regularly scheduled meals. They get a bit of food here and there, sometimes going days between feedings. 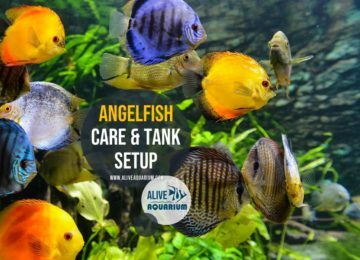 So the concept of feeding your fish two or three times per day as much as it will eat in two minutes simply does not apply. An Oscar will eat a half bag of pellets in two minutes, then regurgitate most of it, try to eat what it regurgitated, regurgitate that, then lay on the bottom of the tank in misery for the rest of the day. The goal, as stated in the premise of this article, is to duplicate or simulate the natural diet of a wild oscar. This involves more frequent, smaller meals, with periods of food deprivation. When you walk by the tank, throw in a pellet or two. Don’t wait until 6pm and throw in 20. Once a week, skip a days feeding. This simulates natural periods of hunger experience by wild Oscars and will help prevent your Oscar from developing boring diet syndrome. Now I do not mean starve your fish. A hungry fish is a healthy fish; a starved one is just dead. Juvenile Oscars will eat more than adult Oscars and the frequent small feedings absolutely applies to young Oscars. Nor should the skip feeding process be practiced on juvenile Oscars, they need food several times a day, each day. Grown Oscars eat much less frequently than do juvenile Oscars. My prior Oscar was only fed every other day. Each fish has a different personality and different metabolism so one rule does not fit all. What is important is understanding your fish. You want your fish to be aggressive when going after any food. Allow this to determine how much to feed and how often. Oscar’s will always play hungry, the “feed me” dance is natures con. Don’t fall for it. I understand that not all of us can perform the “feed several small meals through the day” routine. If this is the case and it is necessary to feed once per day, do not feed until your fish is full. Feed a pellet (or small number of pellets) at a time. Your fish should be aggressive in going after the food. The moment that aggression declines, stop feeding, the fish has been fed enough. I want to emphasis and clarify. I said, “the moment that aggression DECLINES, stop feeding.” It’s not, “at the moment that aggression ends, stop feeding.” There is a difference. If you wait until “that aggression ends”, you’ve vastly overfed your fish. If you feed your Oscar a pellet at a time and watch them eat, you’ll soon know the difference. As a global statement, as a community, we vastly overfed our fish. The primary component of your Oscar fish’s diet should consist of a quality pellet. While this article is not a “review” of different foods, I would consider NLS, Omega One, Dainichi, Hikari Bio-Gold, and (least preferred on the list) Hikari Gold as the “top line” options. Each has its own benefits; any of them will provide a good nutritional foundation for a healthy fish. My primary pellet is Hikari Bio-Gold, because of the resulting reduction in waste, although I wish I could get NLS ingredients with Hikari Bio-Gold’s probiotics. When it comes to pellets, the ingredient list for NLS pellets more closely simulates a wild Oscar’s diet. In addition to a quality pellet, the inclusion of supplemental foods will provide additional benefits, with Krill/Shrimp (fresh, frozen, freeze dried) improving coloration, vegetables and fruits providing improved nutrition (if you can get your Oscar to eat them), and infrequent live foods (crickets recommended) providing mental stimulation, allowing the hunter in your Oscar to emerge. Each of these supplemental foods also helps to prevent boring diet syndrome and the onset of constipation/bloat/blockage that may occur if feeding an all dry diet.